Looking for a new cuisine perfect for the summery weather outside? Try your hand at some Mediterranean cuisine with Culinarian! We promise you won’t regret it. Have you ever wanted to taste authentic Greek cuisine without having to board an airplane across the Atlantic? Well, it turns out you don’t need a plane after all – just take the F train to 2nd Ave and head over to Stanton Street, where you’ll find authentic Greek cuisine at SOUVLAKI GR. You can’t miss the painted cobblestones, tall cerulean open doors, and ivy-draped sign that will make you think you washed up on the coast of the Aegean Sea. Ask to be seated on their second floor; specifically, go up a staircase to a small corner, perfect for a candle-lit date! 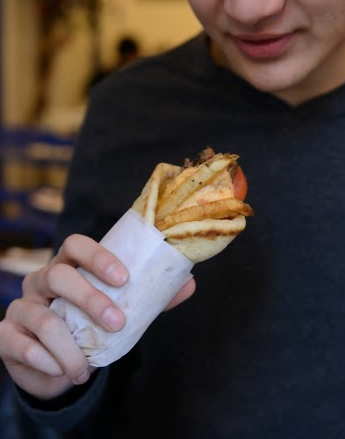 If that’s not enough to make you feel like you’ve left New York, take a bite of the souvlaki. It’s full of spiced grilled chicken and Greek sausage wrapped in pita, along with fresh tomato, onion, and hand-cut fries. This “hamburger of Greece” will convince you that you’re definitely in Mykonos. The best part? The meal is filling and reasonably priced at under $10. Don’t be afraid to try the taramosalata, too; although the pink and creamy salted roe may look strange, it tastes fantastic with pita bread. 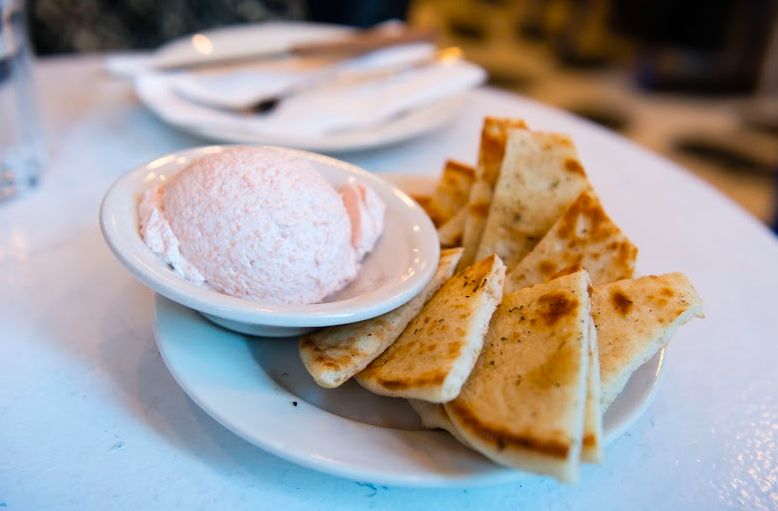 SOUVLAKI also offers other traditional spreads on pita like hummus, melitzanosalata, and skordalia, as appetizers. Kalamaki, skewers served with pita and tzatziki, are also piled on many plates. The bursts of olive oil, squeezes of lemon, and addition of thyme truly add to the vibrant flavorings of all the dishes. Even their choice of sea salt is authentic – Kalas Classic, shipped from Greece. They also offer a large selection of kokkino (red wine), lefko (white wine), and birra (beer) to accompany your grilled meats. Because of its long-established reputation, the restaurant does get very crowded during dinnertime, so it is highly recommended that you place a reservation through OpenTable. They also have their own food truck, in case you don’t have time to stop by for a bite! 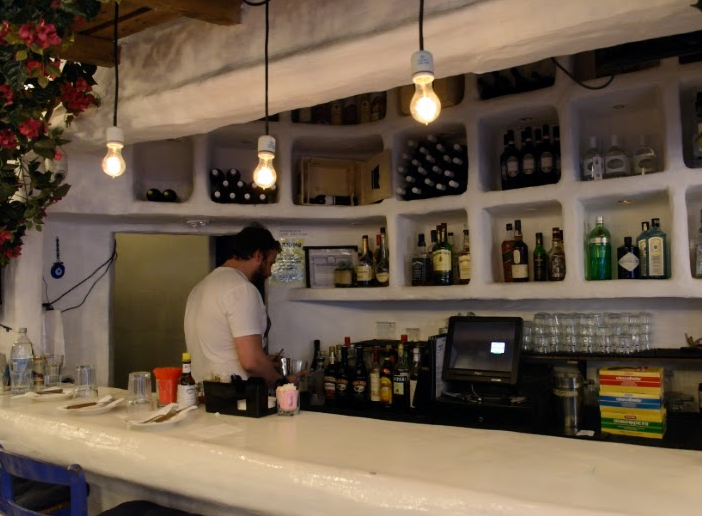 SOUVLAKI GR is located on 116 Stanton St, New York, NY 10002. Make reservations at (212) 777-0116. Tags: greek food, janice fong, kevin he, review, souvlaki gr, spring 2015. Bookmark the permalink. Previous post ← Welcome to the Kickoff of Culinarian’s Summer Issue!